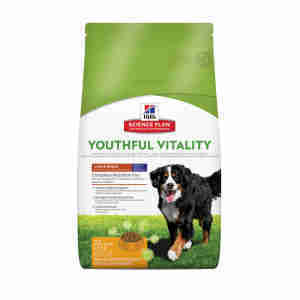 Hill’s Science Plan™ Youthful Vitality Large breed is a complete dog food specially designed with selected nutrients to meet the needs of your senior dog of large breed. The innovative kibble was developed to fight the age-related signs into its advanced years. It contains a mix of selected ingredients, such as antioxidants and unsaturated fats which can minimise the impact of getting older. Along with a selection of dried components, for example beet pulp, carrot, tomato, spinach which are very easy to digest, make this recipe a delicious meal. The addition of beta carotene can fortify the immune system, improving the vision. An adjusted mineral content of phosphorus, sodium, potassium and magnesium keeps bones and teeth healthy. As your dog is getting older he may require special care so as to keep active. Much the same as individuals, dogs can create age-related effects, for example he can start being less active during the day and more awake in the night. If you are unsure about the symptoms, you can ask your veterinarian for advice. Hill’s Science Plan™ Youthful Vitality Large breed formula comes as a source of energy and vitality, helping your dog to stay active. Introducing a balanced meal of vitamins and minerals into their diet can minimise the ageing signs. Large breeds requires special attention for their weights, and reducing the fat level from their diet will help them to carry their body easily. Composition: Maize, brewers´ rice, chicken and turkeymeal, barley, oats, digest, dried whole egg, vegetable oil, animal fat, flaxseed, minerals, dried beet pulp, dried carrots, dried tomato pomace, dried citrus pulp, fish oil, dried spinach, cartilage hydrolysate (source of chondroitinsulphate), crustacean shell hydrolysate (source of glucosamine). Additives per kg: Nutritional additives: E672 (Vitamin A) 40,861 IU, E671(Vitamin D3) 2,151 IU, E1 (Iron) 242mg, E2 (Iodine) 3.6mg, E4 (Copper) 30.7mg, E5 (Manganese) 10.7mg, E6 (Zinc) 206mg, E8 (Selenium) 0.5mg, with natural antioxidant. Analytical Constituents: Protein 20.0%, Fat content 12.8%, Crude fibre 1.6%, Crude ash 5.0%, Omega-3 fatty acids 0.81%, Omega-6 fatty acids 3.54%, Calcium 0.84%, Phosphorus 0.60%, Sodium 0.18%, Potassium 0.74%, Magnesium 0.09%; per kg: Vitamin E 1,265mg , Vitamin C 360mg, Beta-carotene 1.5mg.